Surrounding the 2016 election, the Russian government was quite busy in the U.S. One component of their efforts was an effort to infiltrate the Republican party via the National Rifle Association. Alex Torshin and Maria Butina were point people on that effort. Today, the plea agreement with Butina was released by the Department of Justice. Butina has been in custody since her arrest in July. My interest in Butina’s arrest was due to a minor aspect of the story. Butina also infiltrated the Fellowship Foundation and the National Prayer Breakfast. You can read my posts on Butina’s involvement in the NPB via the links at the end of the post. The NPB is a perfect place to meet people of political influence. Making friends at the NPB is a first step toward making deals of all sorts. Butina hoped to make many friends for her bosses in Russia. Although Fellowship leader Doug Burleigh joked about “Russian collusion,” it is now clear that the Russians were using the NPB for their aims. After the Butina plea agreement, there shouldn’t be anymore scoffing about the seriousness of the Russia investigation. The NRA has been in the news repeatedly in connection with the Mueller probe of U.S. ties to Russian operatives. Back in April, Rolling Stone published a lengthy article by Tim Dickinson which detailed the efforts of Russian nationals connected to Vladimir Putin to infiltrate the NRA under the guise of supporting gun rights in Russia. A key event reported in that article was a trip to Russia arranged for NRA executives and donors and accompanied by Maria Butina, recently indicted by the Justice department for conspiracy and acting as a foreign agent. From Tim Dickinson’s Twitter feed, here is photo of Butina and two NRA leaders in Moscow. To read Tim Dickinson’s Twitter thread on Butina’s Republican contacts, click here. According to the indictment documents, Butina cultivated relationships within Republican party, the NRA, the National Prayer Breakfast, and other Christian right circles (including Eric Metaxas) in order to further the political ends of the Russian government. In April, the NRA admitted receiving donations from Russians but denied any foreign money went to election ads for Trump. Butina’s indictment has raised new suspicions about why the NRA developed such a friendly relationship with an adversary of the U.S. And then just today, a new filing in federal court alleges that Butina was in a cohabitation relationship with Republican operative with close ties to the NRA (identified by the Rolling Stone and other news outlets as possibly Paul Erickson) as a part of her cover. President Trump has denied any collusion with the Russian government. However, this indictment and others recently filed paint a picture of relentless activity on the part of the Russian government to infiltrate organizations friendly to Trump and his wing of the Republican party. I have leaned conservative all my life and I can’t imagine trusting Russians who want to get this close to political power in the U.S. Once upon a time, it was progressives who were accused of being duped by the Russians. Now it appears that Trump Republicans have a special gullibility. ISLA VISTA, Calif., June 5, 2014 /Christian Newswire/ — The Reverend Dr. Rob Schenck, president of the Washington, DC based National Clergy Council, will speak at a news conference tomorrow, June 5, 2014, at 11:00 AM in Isla Vista, California, the scene of a recent mass shooting. In his remarks, Dr. Schenck will warn evangelical pastors and other church leaders against an “unholy alliance” with the NRA. Schenck is in the Santa Barbara area with Rev. Patrick J. Mahoney meeting with church leaders and family members of victims. In January of this year, David Barton told Glenn Beck’s audience that part of the reason the National Rifle Association got started in 1871 was to help newly freed blacks defend themselves after the civil war. Watch Barton at 1:30 in this clip. 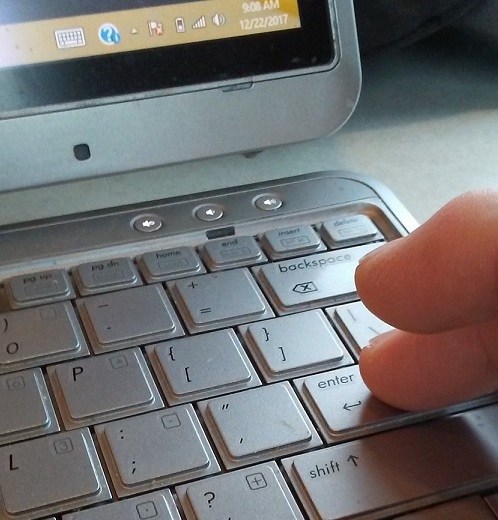 Earlier this month, the fact checking group Politifact.com investigated the matter and gave it their “Pants on Fire” designation which means there is no support for the claim. I was surprised to read in the Politifact article that my post on the subject was actually offered by Alford’s wife as evidence in favor of the claim. In fact, I believe the claim to be false and provided reasons in the post. Since Alford did not offer Barton as a source, I am now wondering if Barton got his information from Alford. In any case, there is no primary source evidence for the claim and Politifact judged it accordingly. David Barton was on the Glenn Beck show last week and claimed to provide a brief history of the National Rifle Association and gun control. As usual, the presentation was interesting but mostly incorrect or misleading. I covered two claims last week. One, Barton claimed Ronald Reagan did not support the gun control efforts of his press secretary James Brady when in fact Reagan did support those efforts and advocated for the Brady Bill. Barton also claimed that the NRA was founded in 1871 by two Union generals who wanted to use the NRA to arm blacks against the KKK. There is no evidence for this claim and important evidence against it. The NRA was started as an effort to help military men use science to improve marksmanship. This post will not be an exhaustive look at other claims but in researching the history of the NRA and gun control, I have learned what historians already knew – the NRA once advocated moderate gun control. Barton also noted that even after the Whiskey and Shays rebellions, and even the assassinations of Lincoln Garfield and McKinley, calls for gun bans never came into play. 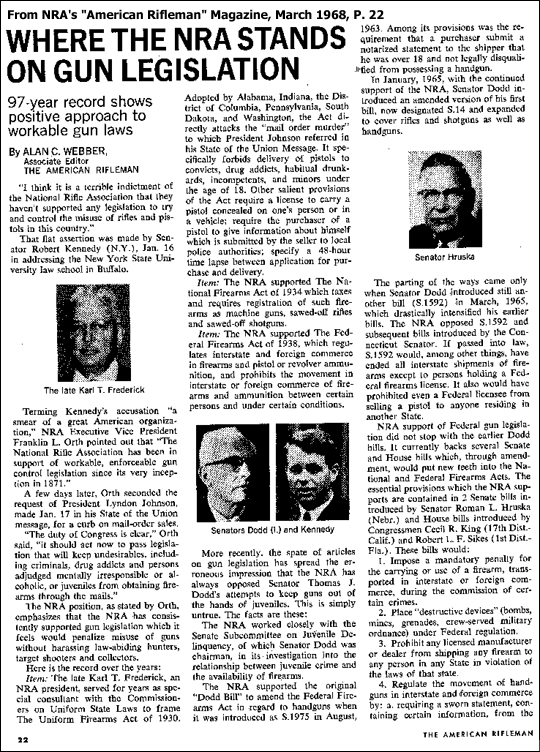 In fact, the times even bolstered the Second Amendment. It was not until the aftermath of Malcolm X, John F. Kennedy, Robert Kennedy and Martin Luther King’s assassination that then President Lyndon B. Johnson sought stricter gun control. Ironically, said Barton, President Reagan — although having survived an assassination attempt himself — was very much an adherent to the Second Amendment and opposed then assistant and White House Press Secretary Jim Brady’s bill. In fact, after the assassination of New York City Mayor William Jay Gaynor, New York passed the Sullivan Act in 1911 which required gun owners to have a license to carry hand guns. While the NRA opposed this bill, they eventually came around to a moderate position and helped develop the Uniform Firearms Act of 1930 which was adopted by five states. Then, the NRA worked with Congress to pass the National Firearms Act of 1934 and supported the Federal Firearms Act of 1938. 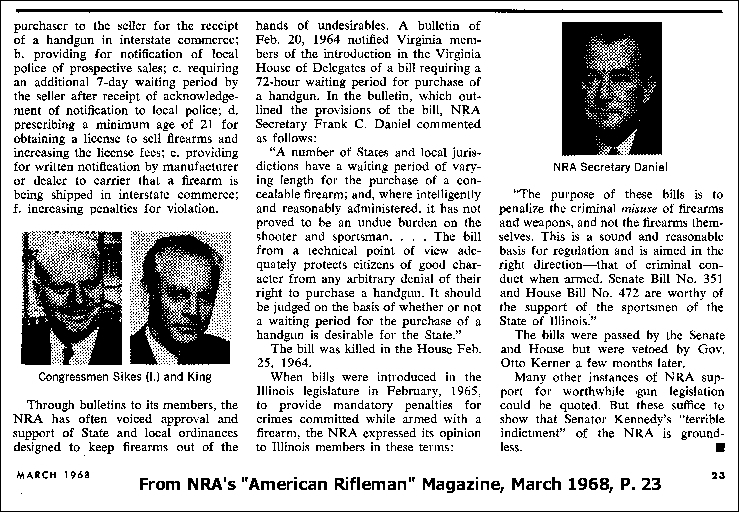 The best explication of the NRA’s record on gun control was provided by the NRA in March, 1968 in their American Rifleman magazine. Senator Bobby Kennedy had criticized the NRA, and with pride wounded, the NRA published an editorial defending its position on gun control. Here are some snippets of that editorial. The editorial continued to note that the NRA supported a seven day waiting period and various other regulations. The scans of the editorial are here (page one) and here (page two). As I understand it, the NRA went through a major change of direction in the late 1970s which led to the current focus on political advocacy surrounding their interpretation of the Second Amendment. However, if the history of the NRA and gun control is going to be part of the societal discussion, one should work with a more complete view than what David Barton presented last week. Was the National Rifle Association started to drive out the KKK? Yesterday, I demonstrated that David Barton incorrectly claimed that Ronald Reagan opposed his press secretary James Brady on gun control. In fact, Reagan advocated for the Brady Bill. In addition, Barton addressed the founding of the NRA. While some like to demonize pro-Second Amendment group and even call it prejudiced, it turns out the powerful group was in fact started by two Union generals in 1871 as a means to driving out the Ku Klux Klan and ensuring that blacks, who although then-free were not allowed means with which to defend themselves — could in fact legally own a gun. On the follow video, Barton draws out the story that the NRA rose up because the Southern leaders were not policing the KKK. Begin listening at the beginning of the clip. Although the introduction of the rifle as a military weapon was owing to the lessons of our Revolution, and although our success in the earlier contests of our history depended upon the skill in its use displayed by our ancestors, no recognition has been given by our citizens of the fact that the change which has taken place in the habits of the American people is rapidly depriving them of that personal skill in arms and marksmanship which has hitherto formed one of the greatest elements of our national strength. This is the more to be regretted, as the introduction of long range breech loaders has made this skill of even more importance at the present time; than under the ancient system for not only the conflict between Prussia and Austria, but the more recent French and Prussian contest have demonstrated that the very accuracy and rapidity of fire, which renders these arms so formidable in the hands of trained marksmen, simply results in a waste of ammunition with those unfamiliar with their use, which leaves an army helpless at the decisive moment of battle. Other nations, recognizing these facts, have long since instituted a thorough system of instruction in rifle practice, France, Germany, Switzerland, and above all, England, and Canada unite in giving to rifle practice a leading position in their systems of military training. In the latter countries, the success that has been attained, not only in producing good marksmen, but in making the subject popular among the people at large has been very great. The Wimbledon contests in England are too well known to need description, and 150,000 trained riflemen are a standing proof of their value. So, on our northern border Canada boasts her 40,000 skilled shots, and has her annual Local Provincial and Dominion matches by which their skill is maintained. In this country, on the other hand, the matter has been entirely neglected, although our entire system of defense is based upon the levying of volunteers in cases of emergency, who, to be valuable or even available, must understand the use of arms and supply by their skill as individuals the confidence which discipline gives to regular troops. While England has a system of rifle practice which is required to be annually and thoroughly performed by every soldier in her army whether stationed in India, Australia, or Europe, our War Department has not even enforced the system of Major Willard, adopted in 1862, and sends raw recruits against the Indian hunters of the plains. In the National Guard of New York, and other States, a similar apathy has prevailed so that it has been the rule, not the exception, for a man to serve out his full term of enlistment in their ranks without firing a shot. This anomalous condition of affairs, having excited considerable discussion among military men through the press, finally on November 24 1871 led to the formation in the City of New York of The National Rifle Association, which was designed and bids fair to be the parent of many similar associations throughout the country. I have looked through early NRA annual reports, biographies of the founders, and other documents looking for any support for Barton’s claim. Any reference to the claim on the web is unsourced. If Barton has a source for his claim, he should bring it up. One nagging uncertainty in this relates to the role of rifle clubs in South Carolina during the campaign for governor in 1876. Wade Hampton and Daniel Chamberlin squared off and eventually both declared victory. Hampton was a Confederate general who was aided by white “rifle clubs” throughout the state. On the other hand, the state armed black militias and some were in rifle clubs of their own. What is not clear yet to me is the affiliation of those rifle clubs. They all may have been local with none affiliated with the NRA. In fact, I can’t find any of the names of the SC clubs in the NRA annual reports, leading me to think that the NRA had nothing to do with either arming blacks or disarming them. In any case, Barton’s claim is that the NRA arose to drive out the KKK. Currently, I see nothing to corroborate that claim. If anything surfaces, of course I will update this post. Author Warren ThrockmortonPosted on January 17, 2013 Categories david barton, historyTags david Barton, kkk, NRA100 Comments on Was the National Rifle Association started to drive out the KKK? In one part of the program, David specifically noted that even in the aftermath of the shootings of Presidents Abraham Lincoln, James Garfield, William McKinley, John Kennedy, and Ronald Reagan, there were not calls for gun control – that even Reagan (while lying in the hospital recovering from the wound) voiced opposition to such efforts. None of these shootings was used as a reason to immediately call for increased regulation of guns, as was done by President Obama in the aftermath of Sandy Hook (thus applying Rahm Emanuel’s axiom to never let a crisis go to waste). But several of David’s obsessive critics, being more concerned with opportunism than truth or context, quickly took to websites and blogs claiming that his statement concerning Reagan was erroneous – that Reagan did support gun control. 1But David’s statement was completely accurate, for it was ten years after Reagan was shot, and three years after he left office before he declared support for the Brady gun control bill. David had made very clear that his context was presidential responses in the aftermath of shootings; and President Reagan, unlike President Obama, had not used an emotional national crisis to call for gun control. Beck: The guy who was shot and almost died on the table, Ronald Reagan – what did he do? Barton: Fought gun control, was not going to allow it, and it didn’t, I mean it didn’t for 15 years. So you had the press secretary of Reagan [James Brady, who was also shot during the assassination attempt on Reagan] who is for it but Reagan himself said, no, no, no, we punish the perpetrators, not taking everybody’s guns away and we just fought that. To me, the context does not make it clear that Barton was only talking about the post-assassination attempt period. Beck asked Barton what Reagan did on gun control and the correct answer would have been he initially opposed it but later changed his mind and favored the Brady bill. However, my post does not make Reagan’s early opposition clear and I should have done so. Reagan did sign a gun control law while governor of California and while president signed a bill in 1986 which restricted new ownership of automatic weapons. However, that same 1986 bill relaxed some restrictions previously in place and Reagan had expressed opposition to strict gun control proposals. Thus, the proper response to questions about Reagan’s position is that he changed his mind over the years and came to favor some gun control proposals. Barton also claims that prior incidents of gun violence did not bring calls for gun control. This is simply incorrect. Perhaps the sitting president in each case did not call for gun control but such proposals have been made by other political leaders in reaction to gun violence throughout our history. A quick review of the ProQuest database of newspapers finds many such calls after the attempt on Reagan and the murder of John Lennon a year before. Earlier, the National Firearms Act of 1934 was in part a response to mob violence at the time. Barton is off here. In the past couple of days, conservatives have been writing about Reagan’s views on gun control. As they point out, Reagan favored the Brady Bill and in 1991 wrote an op-ed for the New York Times advocating passage of the bill. Brady was for modest gun control and Reagan did not say no, no, no. “This is a matter of vital importance to the public safety. . . . Although assault weapons account for less than 1% of the guns in circulation, they account for nearly 10% of the guns traced to crime. . . .
“While we recognize that assault-weapon legislation will not stop all assault-weapon crime, statistics prove that we can dry up the supply of these guns, making them less accessible to criminals. Clearly, Reagan’s views were misrepresented on the Glenn Beck show. Reagan did not oppose James Brady and did not say no, no, no. UPDATE: Thanks to The Blaze for updating their article to reflect this post and Reagan’s actual position on the Brady Bill. Also, I asked gun control expert UCLA prof Adam Winkler if the NRA was started in part to drive out the KKK as Barton told Beck, and he replied briefly: “No.” See his tweet here. No RT “@wthrockmorton: @adamwinkler David Barton said the NRA was founded in part to arm blacks against the KKK. any truth?